It’s pint night, I’m behind the bar, pouring a lot of pints. Big group of Asians come into the bar. They’re in a big circle in the middle of the bar. Did they just come in to warm up, or are they gonna have drinks? I’ll go do dishes, give them some time. Five minutes, I look over, one of the guys come up to the bar. Older, striped sweatshirt. I approach. What’s up, man? What can I get you? He says, this is a martini bar, right? I say, yeah. We serve martinis. He says, I’ve never had a martini before. What. Is. A. Martini? It’s like some kid asking you what is air, and trying to explain it. Here’s the problem. I could explain what a traditional martini is. But we have all these fruity martinis, that pushes the boundaries of what a martini traditionally is. I say, a lot of our martinis are a bunch of Puckers, chilled, in a martini glass. His buddy zooms up to the bar, says, gimme three dirty martinis. To sweatshirt guy, he says, you’re getting a dirty martini. Sweatshirt guy turns to me, says, what’s a dirty martini? 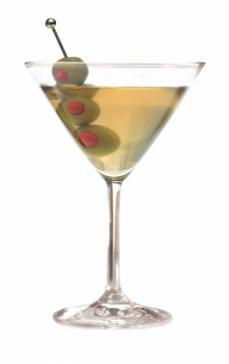 A dirty martini is vodka with olive juice. He says, what’s olive juice? His buddy says, he’s having a dirty martini. Make three. Still, I want the guy to enjoy his first martini. I say, you know, I was thinking, I’d steer him in a different direction for his first martini. Sweatshirt guy says, I’m an alcoholic. I can drink anything. Gimme the dirty martini. I go make the dirty martinis, grab the glasses, the olives, put them out in front of him. I overhear sweatshirt guy say to his friend, with pride, I’ve been to rehab four times. I’ve got my chip. I pour the martinis, they pay, I go help another customer for a minute, look over, sweatshirt guy’s martini glass is in front of him, empty of all contents. I go to him, say, dang. That was quick. He says, I told you I was an alcoholic! That was my fault. I should’ve told him you don’t CHUG a martini. This entry was posted in Bar Story on February 20, 2015 by Clint Curtis.